قطب الدین, نگار, سقایی, علی, منیعات, میلاد, قطب الدین, زهره. (1397). اثر عصاره سیر (Allium sativum) بر بازماندگی، شاخص های رشد، خونی و ترکیب لاشه در ماهی اسکار (Astronotus ocellatus). فصلنامه محیط زیست جانوری, 10(2), 161-168. نگار قطب الدین; علی سقایی; میلاد منیعات; زهره قطب الدین. "اثر عصاره سیر (Allium sativum) بر بازماندگی، شاخص های رشد، خونی و ترکیب لاشه در ماهی اسکار (Astronotus ocellatus)". 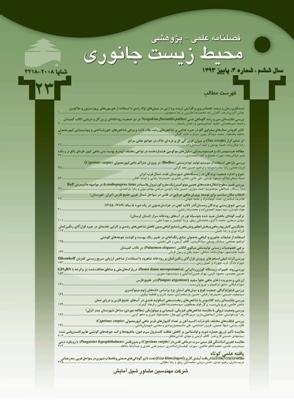 فصلنامه محیط زیست جانوری, 10, 2, 1397, 161-168. قطب الدین, نگار, سقایی, علی, منیعات, میلاد, قطب الدین, زهره. (1397). 'اثر عصاره سیر (Allium sativum) بر بازماندگی، شاخص های رشد، خونی و ترکیب لاشه در ماهی اسکار (Astronotus ocellatus)', فصلنامه محیط زیست جانوری, 10(2), pp. 161-168. قطب الدین, نگار, سقایی, علی, منیعات, میلاد, قطب الدین, زهره. اثر عصاره سیر (Allium sativum) بر بازماندگی، شاخص های رشد، خونی و ترکیب لاشه در ماهی اسکار (Astronotus ocellatus). فصلنامه محیط زیست جانوری, 1397; 10(2): 161-168. در این مطالعه به بررسی اثر عصاره سیر در میزان بازماندگی، رشد، ترکیب لاشه و شاخص­های خونی ماهی اسکار Astronotus ocellatus پرداخته شده است. بدین منظور تعداد 300 قطعه ماهی اسکار (وزن اولیه 0/36±8/37 گرم) در چهار تیمار توزیع شدند و هر تیمار با یک جیره خوراکی شامل بدون عصاره سیر، 0/5 %، 1/5 % و 2/5 % عصاره سیر تغذیه شد. طول دوره آزمایش 8 هفته بود و سپس نمونه ­برداری صورت گرفت و پارامترهای موردنظر براساس روش­ های استاندارد اندازه ­گیریگردید. براساس نتایج به ­دست آمده شاخص­ های رشد مانند افزایش وزن (%)، SGR و FCR در ماهیان تغذیه شده با عصاره سیر بهبود یافت. پروتئین خام تنها در ماهیان تغذیه شده با 1/5 درصد عصاره سیر افزایش یافت در حالی­ که در همین تیمار لیپید خام کاهش یافت. هموگلوبین (Hb) و هماتوکریت (PCV) در تیمارهای تغذیه شده با عصاره سیر افزایش پیدا کرد و تعداد گلبول ­های قرمز (RBC) در تیمار 1/5 % افزایش معنی­ داری نسبت به دیگر تیمارها داشت. نتایج مطالعه بیانگر این است که عصاره سیر اثرات مفیدی بر بازماندگی، شاخص ­های رشد، ترکیب لاشه و شاخص ­های خونی در ماهیان اسکار دارد و بهترین مقادیر در تیمار 1/5 % عصاره سیر مشاهده شد. تنگستانی، ر.؛ علیزاده­ دوغیکلایی، ا.؛ ابراهیمی، ع. و زارع، پ.، 1389. اثر اسانس سیر بر شاخص ­های هماتولوژیک فیل ماهیان جوان پرورشی. مجله تحقیقات دامپزشکی، دوره 66، شماره3، صفحات 209 تا 216. صمدی،ل.،1391. اثرات عصاره سیر (Allium sativum) بر شاخص­ های رشد و پارامترهای همولنف میگوی پا سفید غربی (Litopenaeus vannamei)، پایان ­نامه کارشناسی­ ارشد شیلات، دانشگاه علوم و فنون دریایی خرمشهر. Abd El Hakim, N.F. ; Ahmad, M.H. ; Azab, E.S. ; Lashien, M.S. and Baghdady, E.S., 2010. Response of Nile tilapia, Oreochromis niloticus to diets supplemented with different levels of fennel seeds meal (Foeniculum vulgare). Abbassa International Journal of Aquaculture. Vol. 3, pp: 215-230. Agatha, A.D., 2012. the effect of Garlic (Allium sativum) on growth and Hematological parameters of Clarias gariepinus. sustainable Agriculture Research. Vol. 1, No. 2, pp: 222-228. Ahmad, M.H. and Abdel-Tawwab, M., 2011. The use of caraway seed meal as a feed additive in fish diets: Growth performance, feed utilization, and whole-body composition of Nile tilapia, Oreochromis niloticus (L.) fingerlings. Aquaculture. Vol. 314, No. 1, pp: 110-114. Akbary, P. and Shahraki, N., 2016. Effect of Padina atraulis extract on growth, feed, fatty acids profile and carcass composition in Mugil cephalus Linnaeus, 1758. Iranian fisheries sceince journal. Vol. 25, No. 2, pp: 161-170. Aly, S.M. and Mohamed, M.F., 2010. Echinacea purpurea and Allium sativum as immunostimulants in fish culture using Nile tilapia (Oreochromis niloticus). Journal of Animal Physiology and Animal Nutrition. Vol. 94, No. 5, pp: 31-39. Amagase, H. and Milner, J.A., 1993. Impact of various sources of garlic and their constituents on 7, 12-dimethylbenz [α] anthracene binding to mammary cell DNA. Carcinogenesis. Vol. 14, No. 8, pp: 1627-1631. Ashley, P.J., 2007. Fish welfare: current issues in aquaculture. Applied Animal Behaviour Science. Vol. 104, No. 3, pp: 199-235. Bagni, M.; Romano, N.; Finoia, M.G. ; Abelli, L.; Scapigliati, G.; Tiscar, P.G. and Marino, G., 2005. Short-and long-term effects of a dietary yeast β-glucan (Macrogard) and alginic acid (Ergosan) preparation on immune response in sea bass (Dicentrarchus labrax). Fish & Shellfish Immunology. Vol. 18, No. 4, pp: 311-325. Block, E., 1992. The organosulfur chemistry of the genus Allium–implications for the organic chemistry of sulfur. Angewandte Chemie International Edition in English. Vol. 31, No. 9, pp: 1135-1178. Blumenthal, M.; Goldberg, A. and Brinckmann, J., 2000. Herbal medicine Integrative medicine communications. Austin. Vol. 8, 401 p.
Breyer, K.E. ; Getchell, R.G. ; Cornwell, E.R. ; Wooster, G.A. ; Ketola, H.G. and Bowser, P.R., 2015. Efficacy of an Extract from Garlic, Allium sativum, Against Infection with the Furunculosis Bacterium, Aeromonas salmonicida, in Rainbow Trout, Oncorhynchus mykiss. Journal of the World Aquaculture Society. Vol. 46, No. 3, pp: 273-282. Cabello, F.C., 2006. Heavy use of prophylactic antibiotics in aquaculture: a growing problem for human and animal health and for the environment. Environmental Microbiology. Vol. 8, No. 7, pp: 1137-1144. Chakraborty, S.B. and Hancz, C., 2011. Application of phytochemicals as immunostimulant, antipathogenic and antistress agents in finfish culture. Reviews in Aquaculture. Vol. 3, No. 3, pp: 103-119. Citarasu, T., 2010. Herbal biomedicines: a new opportunity for aquaculture industry. Aquaculture International. Vol. 18, No. 3, pp: 403-414. Diab, A.S.; Aly, S.M. ; John, G.; Abde-Hadi, Y. and Mohammed, M.F., 2008. effect of garlic, black seed and biogen as immunostimulats on the growth and survival of Nile tilapia, Oreochromis niloticus, and their response to artificial infection with Pseudomonas fluorescens. African journal of Aquatic Science. Vol. 33, No. 1, pp: 63-68. Farahi, A.; Kasiri, M.; Sudagar, M.; Iraei, M.S. and Shahkolaei, M.D., 2010. effect of garlic (Allium sativum) on growth factors, some hematological parameters and body compositions in rainbow trout (Oncorhynchus mykiss), Aquaculture, Aquarium, Conservation and Legislation international journal of the Bioflux Society. Vol. 3, No. 4, pp: 317-323. Harikrishnan, R.; Balasundaram, C. and Heo, M.S., 2012. Effect of Inonotus obliquus enriched diet on hematology, immune response, and disease protection in kelp grouper, Epinephelus bruneus against Vibrio harveyi. Aquaculture. Vol. 344, pp: 48-53. Harikrishnan, R.; Kim, D.H.; Hong, S.H. ; Mariappan, P.; Balasundaram, C. and Heo, M.S., 2012. Non-specific immune response and disease resistance induced by Siegesbeckia glabrescens against Vibrio parahaemolyticus in Epinephelus bruneus. Fish & Shellfish Immunology. Vol. 33, No. 2, pp: 359-364. Kajita, Y.; Sakai, M.; Atsuta, S. and Kobayashi, M., 1990. The immunomodulatory effects of levamisole on rainbow trout, Oncorhynchus mykiss. Fish Pathology. Vol. 25, No. 2, pp: 93-98. Lee, D.H.; Ra, C.S. ; Song, Y.H. ; Sung, K.I. and Kim, J.D., 2012. Effects of dietary garlic extract on growth, feed utilization and whole body composition of juvenile sterlet sturgeon (Acipenser ruthenus). Asian-Australasian Journal of Animal Sciences. Vol. 25, No. 4, pp: 577-583. Lee, S.; Najiah, M.; Wendy, W. and Nadirah, M., 2009. Chemical composition and antimicrobial activity of the essential oil of Syzygium aromaticum flower bud (Clove) against fish systemic bacteria isolated from aquaculture sites. Frontiers of Agriculture in China. Vol. 3 No. 3, pp: 332-336. Logambal, S.M. ; Venkatalakshmi, S. and Michael, R.D., 2000. Immunostimulatory effect of leaf extract of Ocimum sanctum Linn. in Oreochromis mossambicus (Peters). Hydrobiologia. Vol. 430, No. 1-3, pp: 113-120. Makkar, H.P.S. ; Francis, G. and Becker, K., 2007. Bioactivity of phytochemicals in some lesser-known plants and their effects and potential applications in livestock and aquaculture production systems. Vol. 1, No. 9, pp:1371-1391. Maniat, M., Ghotbeddin, N. and Ghatrami, E.R., 2014. Effect of Garlic on Growth Performance and Body Composition of Benni Fish (Mesopotamichthys sharpeyi). International Journal of Biosciences (IJB). Vol. 5, No. 4, pp: 269-277. Miranda, C.D. and Zemelman, R., 2002. Antimicrobial multiresistance in bacteria isolated from freshwater Chilean salmon farms. Science of the Total Environment. Vol. 293, No. 1, pp: 207-218. Mohapatra, S.; Chakraborty, T.; Kumar, V.; DeBoeck, G. and Mohanta, K.N., 2013. Aquaculture and stress management: a review of probiotic intervention. Journal of Animal Physiology and Animal Nutrition. Vol. 97, No. 3, pp: 405-430. Naylor, R. L.; Goldburg, R. J.; Primavera, J. H.; Kautsky, N.; Beveridge, M.C.M. ; Clay, J. and Troell, M., 2000. Effect of aquaculture on world fish supplies. Nature. Vol. 405, No. 6790, pp: 1017-1024. Nya, E.J. and Austin, B., 2009. Use of garlic, Allium sativum, to control Aeromonas hydrophila infection in rainbow trout, Oncorhynchus mykiss (Walbaum). Journal of Fish Diseases. Vol. 32, No. 11, pp: 963-970. Nya, E.J. and Austin, B., 2011. Development of immunity in rainbow trout (Oncorhynchus mykiss, Walbaum) to Aeromonas hydrophila after the dietary application of garlic. Fish & Shellfish Immunology. Vol. 30, No. 3, pp: 845-850. Olusola, S.E. ; Emikpe, B.O. and Olaifa, F.E., 2013. The potentials of medicinal plant extracts as bio antimicrobials in aquaculture. International Journal of Medicinal and Aromatic Plants. Vol. 3, No. 3, pp: 404-412. Panigrahi, A. and Azad, I.S., 2007. Microbial intervention for better fish health in aquaculture: the Indian scenario. Fish Physiology and Biochemistry. Vol. 33, No.4, pp: 429-440. Pasnik, D.J. ; Evans, J.J.; Panangala, V.S. ; Klesius, P.H. ; Shelby, R.A. and Shoemaker, C.A., 2005. Antigenicity of Streptococcus agalactiae extracellular products and vaccine efficacy. Journal of Fish Diseases. Vol. 28, No. 4, pp: 205-212. Pavaraj, M.; Balasubramanian, V.; Baskaran, S. and Ramasamy, P., 2011. Development of immunity by extract of medicinal plant Ocimum sanctum on common carp Cyprinus carpio (L.). Research journal of immunology. Vol. 4, No. 1, pp:12-18. Platel, K. and Srinivasan, K., 2004. Digestive stimulant action of spices: A myth or reality, Iranian Journal of Medical Research. Vol. 119, pp: 167-179. Pour, F.; Maniat, M.; Vahedasl, A. and Ghayem, SH., 2014. enhancement of growth performance and body composition in molly fish (Poecilia sphenpos) associated with dietary intake of garlic (Allium sativum). international journal of Biosciences. Vol. 5, No. 8, pp: 115-121. Qiu, X.C. ; Zhou, H.Q. ; Yokoyama, M. and Liu, X.G., 2003. The effects of dietary Chinese herb additives on biochemical compositions in the muscle of Allogynogenetic crucian carp. Journal of Shanghai Fisheries University (China). Vol. 12, pp: 24-28. Quesada, S.P. ; Paschoal, J.A.R. and Reyes, F.G.R., 2013. Considerations on the aquaculture development and on the use of veterinary drugs: special issue for fluoroquinolonea review. Journal of Food Science. Vol. 78, No. 9, pp: R1321-R1333. Raa, J.; Roerstad, G.; Engstad, R. and Robertsen, B., 1992. The use of immunostimulants to increase resistance of aquatic organisms to microbial infections. Diseases in Asian Aquaculture. Vol. 1, pp:39-50. Ranzani-Paiva, M.J.T. ; Ishikawa, C.M. ; Eiras, A.C. das and Silveira, V.R.da., 2004. Effects of an experimental challenge with Mycobacterium marinum on the blood parameters of Nile tilapia, Oreochromis niloticus (Linnaeus, 1757). Brazilian Archives of Biology and Technology. Vol. 47, No. 6, pp: 945-953. Rico, A.; Phu, T.M. ; Satapornvanit, K.; Min, J.; Shahabuddin, A.M.; Henriksson, P.J.G. and Van den Brink, P.J., 2013. Use of veterinary medicines, feed additives and probiotics in four major internationally traded aquaculture species farmed in Asia. Aquaculture. Vol. 412, pp: 231-243. Sahu, S.; Das, B.K. ; Mishra, B.K. ; Pradhan, J. and Sarangi, N., 2007. Effect of Allium sativum on the immunity and survival of Labeo rohita infected with Aeromonas hydrophila. Journal of Applied Ichthyology. Vol. 23, No. 1, pp: 80-86. Sakai, M., 1999. Current research status of fish immunostimulants. Aquaculture. Vol. 172, No. 1, pp: 63-92. Sandnes, K.; Lie, Ø. and Waagbø, R., 1988. Normal ranges of some blood chemistry parameters in adult farmed Atlantic salmon, Salmo salar. Journal of Fish Biology. Vol. 32, No. 1, pp: 129-136. Seyfried, E.E. ; Newton, R.J.; Rubert, K.F. ; Pedersen, J.A. and McMahon, K.D., 2010. Occurrence of tetracycline resistance genes in aquaculture facilities with varying use of oxytetracycline. Microbial Ecology. Vol. 59, No. 4, pp: 799-807. Shalaby, A.M.; Khattab, Y.A. and Abdel Rahman, A.M., 2006. Effects of garlic (Allium sativum) and chloramphenicol on growth performance, physiological parameters and survival of Nile Tilapia (Oreochromis niloticus). Journal of Venomous Animals and Toxins Including Tropical Diseases. Vol. 12, No. 2, pp: 172-201. Sivaram, V.; Babu, M.M. ; Immanuel, G.; Murugadass, S.; Citarasu, T. and Marian, M.P., 2004. Growth and immune response of juvenile greasy groupers (Epinephelus tauvina) fed with herbal antibacterial active principle supplemented diets against Vibrio harveyi infections. Aquaculture. Vol. 237, No. 1, pp: 9-20. Takaoka, O.; Ji, S.; Ishimaru, K.; Lee, S.; Jeong, G.; Ito, J. and Takii, K., 2011. Effect of rotifer enrichment with herbal extracts on growth and resistance of red sea bream, Pagrus major (Temminck & Schlegel) larvae against Vibrio anguillarum. Aquaculture Research. Vol. 42, No. 12, pp: 1824-1829. Talpur, A.D. and Ikhwanuddin, M., 2012. Dietary effects of garlic (Allium sativum) on haemato-immunological parameters, survival, growth, and disease resistance against Vibrio harveyi infection in Asian sea bass, Lates calcarifer (Bloch). Aquaculture. Vol. 364, pp: 6-12.